Good morning everyone! It's Saturday and Create with Connie and Mary have just finished up week 2 of the Spring Collection! WOW! Amazing projects were shared this week including one of mine! If you didn't get to see them no need to worry! You can still see all the projects that have been shared and download all the tutorials by signing up today! So on Saturdays Create with Connie and Mary have a challenge to finish off the week. This week we have a color challenge. Take a look! 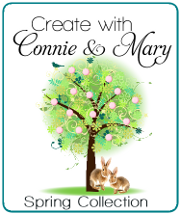 Find more inspiration from the design team at Create with Connie and Mary. I'm looking forward to seeing what you will do with these colors! Thanks for stopping by and have a super day! I love your card Deb, especially the white embossing with the pearls. Great use of the DSP too; I've been struggling to use this pattern as every time I look at it I think of alligator skin! Wow! The white embossing really POPS on your card! LOVE it! Great job with the color challenge!